Highest level in April at the lagoon level since 1936 – half of the city center is flooded. Venice has been under heavy rain in recent days which drowned the city under water. The level in the lagoon of the northern Italian city reached a height of 147 centimeters on Friday, said the local tidal monitoring center. This is the highest level in the month of April since 1936. This means that 50 percent of the city center is flooded. Because streets and squares were flooded, tourists waded barefoot through the water. 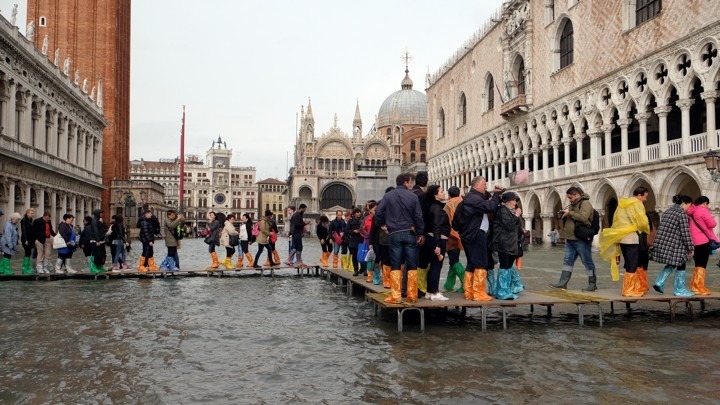 As is usual with “acqua alta”, the authorities laid out wooden walkways so that pedestrians could keep their feet dry. The flooding in Venice comes from strong tides, strong south wind, and heavy rain. Northern Italy has been hit by heavy rains for several days which resulted in drowning the city center.